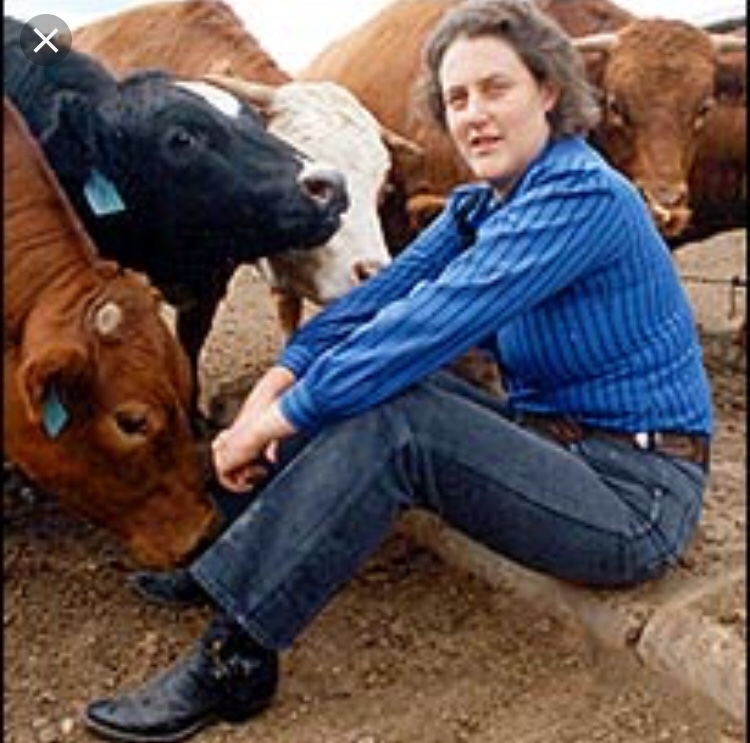 Temple Grandin (Born: 29 Aug 1947) is an American professor of animal science at Colorado State University and counsels the livestock industry on animal behavior. She is an autism activist and because of being on the autism spectrum, can offer a personal perspective of life and perception. She invented a device called a hug box which helps to calm people on the autism spectrum. She was born Mary Temple Grandin in Boston, Massachusetts. Her mother, Anna Eustacia Cutler (still living) was a Harvard graduate, an actress, singer and granddaughter to the co-inventor of the autopilot aviation system. Temple’s father, Richard McCurdy Grandin was a real estate agent and heir to the largest wheat farm business, Grandin Farms. Her parents divorced when she was a teenager. Although raised in the Episcopal church, Temple gave up on a belief in a personal deity in favor of a more scientific idea of God. While reading about her, I found that she was never formally diagnosed with autism in her childhood but instead (at age 2) her parents were told she had brain damage. Her mother happened to find Dr Bernard Rimland’s checklist on autism and, once she completed it, believed that Temple might have displayed characteristics. It was not until Temple was in her mid 40s that she was formally diagnosed as an autistic savant. Because her mother was unaccepting of the possibility of institutionalization, she worked diligently to find alternative treatments that might be beneficial. At the advice of a neurologist, she hired a speech therapist. She also hired a nanny to engage with Temple through educational material and games for hours every day. She endured years of taunting during her middle and high school years. She described an occasion of being called a tape recorder because of her repetitive speech. In recalling the incidents she stated “I could laugh about it now, but back then it really hurt.” In ninth grade, she was expelled from school for throwing a book at a classmate who taunted her. Her parents disagreed on Temple’s upbringing, her father siding with professionals calling for institutionalization. The year after her expulsion, her parents divorced. Three years later Anna would marry Ben Cutler, a NYC saxophonist. When she was fifteen, Temple would spend a summer on a ranch owned by Ben’s sister Ann. It would lead to her love of animals and change her life forever. Because of her expulsion, Anna moved Temple to a private boarding school in New Hampshire for students with behavioral issues. Here she would meet William Carlock, a science teacher with a career background at NASA. Carlock would become Temple’s mentor and worked with her on her self confidence. Through his mentoring and assistance, Temple conceived the plan for the hug box or, as she called it, the squeeze machine. His advice and mentoring continued after she graduated from school. During a time of criticism for her invention, it was Carlock who suggested scientific experiments to test and evaluate the viability of the squeeze machine. Temple Grandin earned a bachelor’s degree in human psychology from Frankline Pierce College, a masters in animal science from Arizona State and a doctoral in animal science from the University of Illinois. She is the foremost advocate of humane treatment of livestock for slaughter in the world and is internationally known for her lectures on autism. Developing Talents: Careers for Individuals with Asperger Syndrome and High-Functioning Autism (2004). Improving animal welfare: a practical approach (2010). Livestock handling and transport (2007). Grandin, T. 2013. Making slaughterhouses more humane for cattle, pigs, and sheep. Annual Review of Animal Biosciences. 1:491-512. Grandin, T. 2001. Cattle vocalizations are associated with handling and equipment problems at beef slaughter plants. Applied Animal Behaviour Science. Volume 71, 2001, Pg. 191-201. Grandin, T. 1996. Factors That Impede Animal Movement at Slaughter Plants. Journal of the American Veterinary Medical Association. 209 No.4:757-759. Grandin, T. 1995. Restraint of Livestock. Proceedings: Animal Behaviour Design of Livestock and Poultry Systems International Conference (pages 208-223). Published by: Northeast Regional Agriculture Engineering Service. Cooperative Extension. 152 Riley – Robb Hall, Ithaca, New York, 14853 USA. Grandin, T. 1994. Euthanasia and Slaughter of Livestock. Journal of American Veterinary Medical Association. Volume 204:1354-1360. Grandin, T. 1989 (Updated 1999). Behavioral Principles of Livestock Handling. Professional Scientist. December 1989 (pages 1–11).